Cinderella and the Fairy Godmother. Home » Cinderella and the Fairy Godmother. Gustav Dore, Arist. A. Pisan, Engraver. 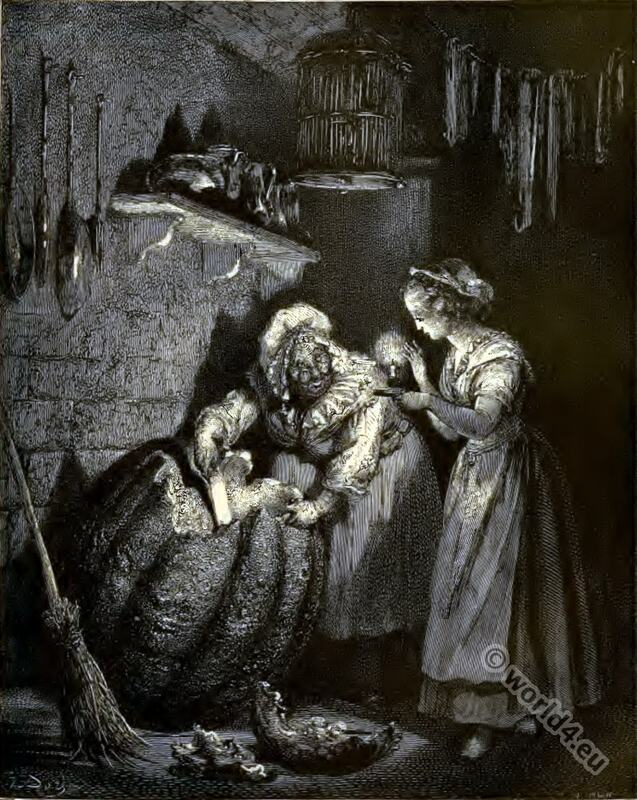 AFTER Cinderella had dressed her two sisters for the ball, she followed them with her eyes as long as she could, and when she could see them no more, she began to cry. Her godmother, seeing her all in tears, asked her what was the matter. “I wish—I wish—” she cried so hard that she could not go on; her godmother, who was a fairy, said to her, “You would be pleased to go to the ball. Would you not? ” “Alas, yes!” said Cinderella, sighing. 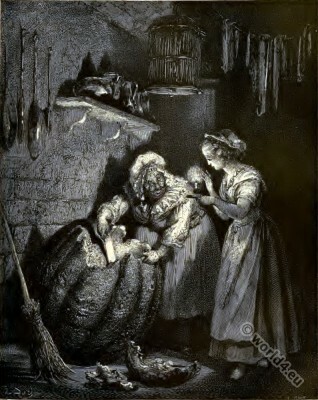 “Very well, be a good girl,” said her godmother, “and I will help you to go.” She then took her into her room and said to her, “Go into the garden and bring me a pumpkin.” Cinderella went quickly and gathered the finest she could find and brought it to her godmother, not comprehending how this pumpkin could make it possible for her to go to the ball; her godmother hollowed it out, and having left only the skin, struck it with her wand, and the pumpkin was immediately changed into a beautiful gilded chariot. Charles Perrault (1628-1703) was a French writer and senior official. He was mainly through his fairy tale collection Contes de Fées (“Fairies”) famous and has popularized the genre in France and thus in Europe. Perrault’s collection in France signified a breakthrough for the genre tale. Many of the tales of Perrault were adapted to the European common good and for the theater, ballet and film. Associated to: Rhodope, the Egyptian Princess by Georg Ebers. This entry was posted in 1892, Fairy Tales, Genre and tagged Character sketches on 3/23/15 by world4.